The Hinkley Chandon designer large 9 light chandelier in Sterling silver finish with ribbed glass shades features timeless elegance and incredible quality. This chandelier is full of contemporary tradition. Suspended from a central circular plate and chain and finished in Sterling silver, with solid crystal central column and nine upward curved arms on two tiers. A timeless creation that is certain to complement almost any type of style. 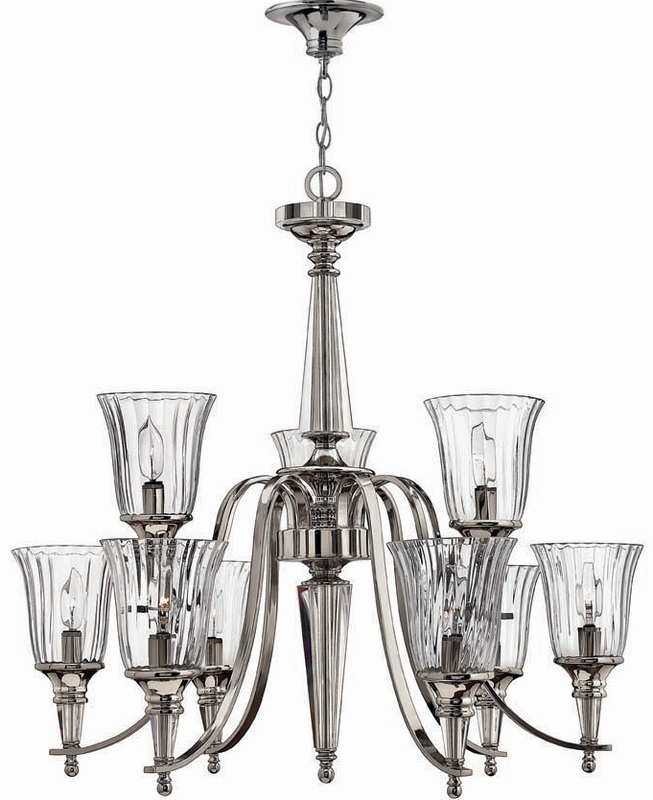 You can picture this incredibly stylish chandelier in any traditionally themed or contemporary home. It is a lavish modern example of a traditional candle light. The Chandon boasts an extremely attractive demure, whilst not being overly elaborate. The detail in the design creates an overall image of a fine Georgian dining. The wonderful fluted ribbed glass shades are made from optically clear glass and are reminiscent of gas lamp shades, whilst the solid crystal encased stem and lamp finials add opulence and style. Shown here on a short chain but supplied with 300cm of chain that can be shortened at the time of installation. Minimum height 89cm, maximum drop 394cm. Supplied by Elstead Lighting and designed in the USA by Hinkley Lighting, founded in 1922 in Cleveland, Ohio. Their long heritage combines with a pursuit of innovative design to create modern and contemporary lighting to create stunning designs like the Chandon designer large 9 light chandelier in Sterling silver finish with ribbed glass shades you see here.